If you’ve seen a Monster Hunter game in action then you’ve probably been in awe of its flashy, acrobatic combat. These are, after all, games about heroes doing battle with some of the largest foes seen in videogames. Monster Hunter: World continues that tradition, but with the best graphics and animation the series has ever had. As such, it’ll come as no surprise that this latest entry has combat impressive enough to knock you off your scaly feet, exposing your soft underbelly to the blades of any nearby hunters. Monster Hunter: World is the first main entry in the series to make its way to PC. That means there’s a good chance you’re unaware of the many unique intricacies of the game’s battle systems. Despite having similarities to a few other games, Monster Hunter practically invented its own rule book, so there’s plenty to learn before you can become a master of the hunt. From combos to weapons and even stamina, everything works a little different in Monster Hunter: World to what you may be used to in other games. But fear not, as our combat showcase will introduce you to all the key concepts, figuratively sharpening your weapon before you jump into the slaughter. First, you need to understand that your choice of weapon dictates your fighting style. Monster Hunter: World has much in common with RPGs, but it doesn’t have a traditional class system. Instead, your role in battle is dictated by whether your equipped weapon is cutting, blunt, or uses one of the ammo types – this in turn establishes which attacks you can perform. Cutting weapons – those with sharp, bladed edges – are by far the most numerous in the game, and are the vital foundations of a good team. There are nine in total, from simple, intuitive equipment like the Sword and Shield and Great Sword, to the complex combos of the Gunlance and the acrobatic leaps of the Insect Glaive. These weapons can slice through enemy flesh with ease and can be relied up for outputting consistent damage. When using cutting weapons it’s important to monitor their sharpness; a dull blade won’t be any help when facing down an Anjanath! A meter on the HUD informs you how sharp your blade is – keep an eye on it. When it gets too blunt you’ll need to pull back from the heat of combat and use a whetstone to sharpen it back up. It takes some getting used to, but think of it like reloading guns in a shooter: you need to do it to make sure you’re ready for every moment. Sharp weapons are the best pick for those who love to be on the front lines of battle, but those looking to play a supporting role in their party should opt for blunt weapons. The Hammer and Hunting Horn may not be able to slice the tail off a Pukei-Pukei, but a perfect slam to the skull with one of these weapons will help stun a monster and allow your party to deal damage without fear of being attacked themselves. Blunt weapons can help reduce a monster’s stamina, and without stamina they’re all but defenceless. 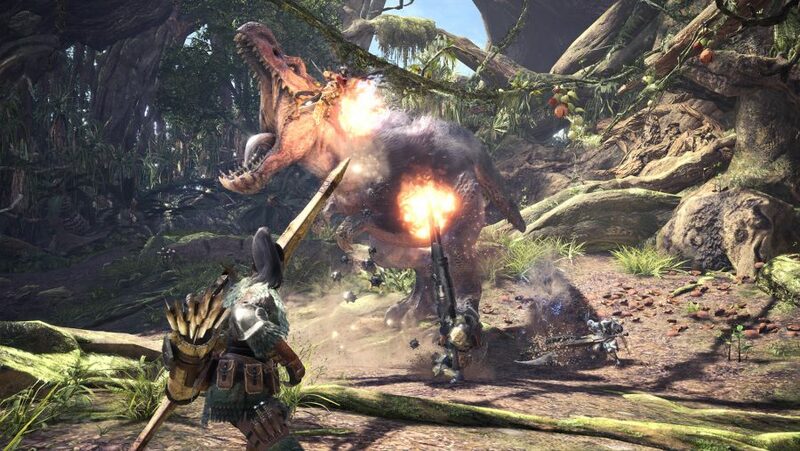 Hammers and Horns are also your ticket to breaking an armoured creature’s toughest parts; blunt damage will crush a Barroth’s jaw, for example. Finally, those who’d rather keep well out of the way of a monster’s claws should pick up an ammo weapon. 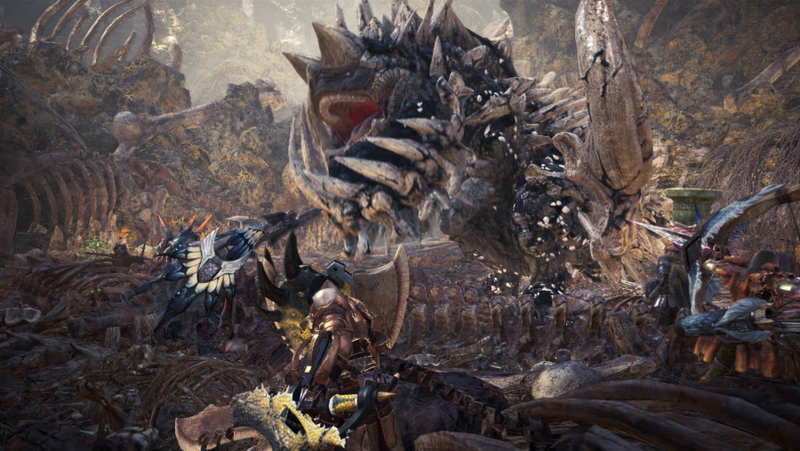 These long-range bows turn Monster Hunter: World into a third-person shooter. These projectile weapons can be loaded with dozens of different ammunition types to inflict status effects on your target. It’s a very different way to play the game when compared to the melee weapons, but no less tactically satisfying. And who doesn’t want to fire a salvo of electrified arrows into the side of a Rathalos? 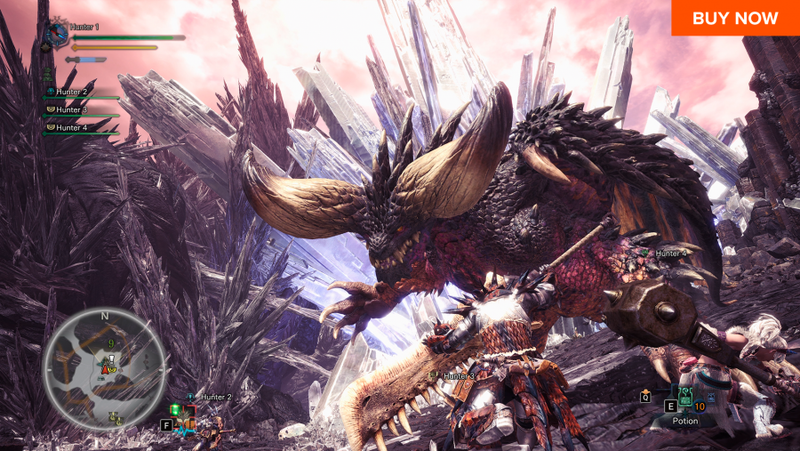 Monsters are not just enemies in Monster Hunter: World: they’re sources of crafting materials that go towards building better weapons and armour. But there’s a secret to harvesting the best items from your defeated prey: breaking specific body parts. While you can attack any area of a monster and gradually reduce its health, the smartest hunters will target a specific part and repeatedly attack it until it breaks. This not only inflicts huge damage, but increases the chance of harvesting the specific items you need for gear you’re hoping to craft. While any weapon can be used to break a monster part, the best results come from using the most suitable gear for your target. Cutting weapons can be used to slice appendages off monsters. Aim for a beast’s tail and do repeated damage to it in order to cut it clean off. You’ll be able to collect the tail, inflict plenty of damage, and will prevent the monster from attacking with its tail. Need to break a skull? The crushing power of a blunt weapon will be your best bet. While your gear stats may suggest an RPG approach to combat, Monster Hunter: World actually shares more combat DNA with hack-and-slash games. Combos are at the heart of Monster Hunter’s scuffles; chaining together light and heavy attacks in patterns to unleash more powerful and exciting moves. It’s tricky to start with, but you’ll soon master your chosen weapon’s plethora of special attacks. And when you’ve got it all nailed down, you’ll be able to thrust, slice, charge, and fire your Gunlance without stopping for breath. Your prey won’t know what’s hit them! 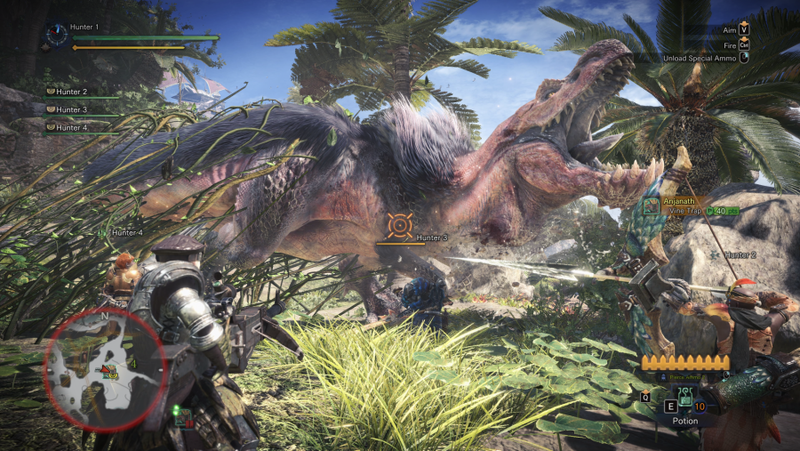 When you’ve got to grips with how to use your weapon, its combos, and how to break monster parts, you’ll be comfortable taking on some of Monster Hunter: World’s more advanced beasts. 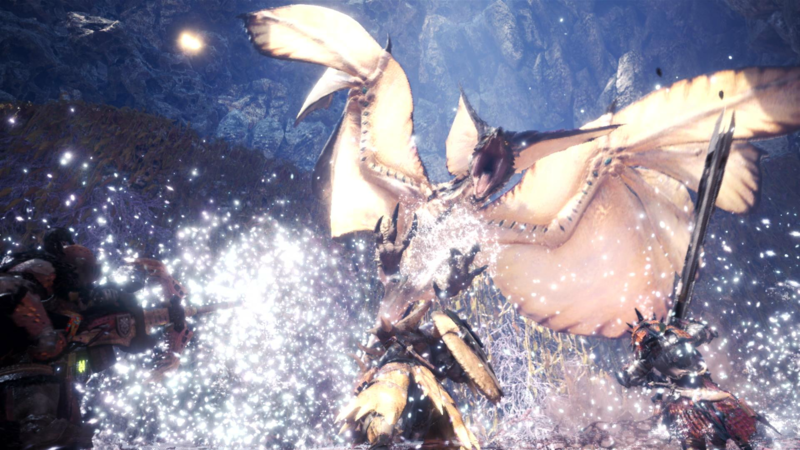 But bringing a Kushala Daora to its knees is more than a one-person job, so it’s wise to make the most of Monster Hunter: World’s best feature: co-op multiplayer. Working together with up to three others allows you to develop tactics around each individual monster; learning their attack patterns, baiting them out, and then unleashing the power of numerous combos chained together from all angles to brutally damage them. A good team can bring down the toughest of monsters, and not only will that give you a great feeling, you’ll pick up some amazing loot too. Monster Hunter: World is out now on PS4 and Xbox, with the game coming to Steam on August 9, 2018.